Trimarin TM600 (Pula - Rovinj - Rabac - Poreč - Umag) ************* From our starting point in Banjole it is easy to reach Brijuni islands, as well as cape Kamenjak. 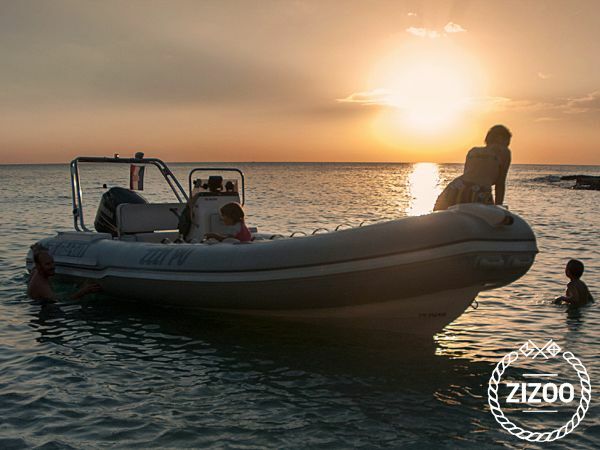 ************* For 7 or more days rent, delivery is free anywhere in Istria, and also included are a towing ring and a wakeboard set. ************* For deliveries in a rent period of 3-6 days You pay only for petrol/necessary toll (20 Eur total for Rovinj, 40 Eur Umag...). For 1 or 2 days rent, boat takeover is possible only in Banjole, Pula. ************* Our boat is equiped with a Yamaha F115 AETL engine, a GPS, fridge Waeco, music player (usb/aux/bluetooth), shower, sunshade and safety equipment. ************* Prices depend on the number of days You choose. Cleaning is included in price. Small/medium sized pets are allowed on the boat. **************************************************************** Mooring fees and fuel are not included in price (You get a full tank of 120l + 20l reserve, and must return the same). ************* The boat is registered for up to 3 Nm from the coast. *****A day starts at 9:00h and ends at 19:00h (10 hours for 1 day rents). A week for example starts at 9:00h on the 1st day, and ends at 19:00h on the 7th day. ************* For up to 9 persons, an international B category boat driving licence is needed (must bring at takeover). If there are exactly 10 persons, another person with at least an A category licence is needed.